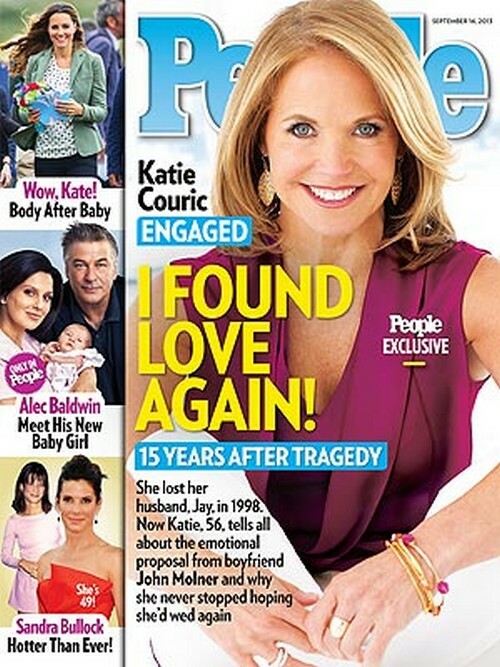 Katie Couric and financier John Molner are engaged, and Katie covers this week’s issue of People Magazine and opens up about how the engagement happened. Katie’s been married once before and has kids from that marriage, but her husband ended up passing away from colon cancer. She has revealed that it took her a long time to open up to the chance of having another serious relationship or marriage, but when John came around, she knew it was the right time. I do have to say, the days of stars and celebrities revealing their engagements on People is slowly fading. With the blur between reality stars and legitimate stars both getting front page announcements on People [i.e. Kate Gosselin and Brad/Angelina weeks apart], the legitimate movie stars or celebrities are starting to seek alternative methods of announcing their engagement/marriages/pregnancies. I would group Katie in with the ‘legitimate’ set, so perhaps she should seek another way to reveal her engagement, no? But I guess her target audience does end up reading People before anything else.